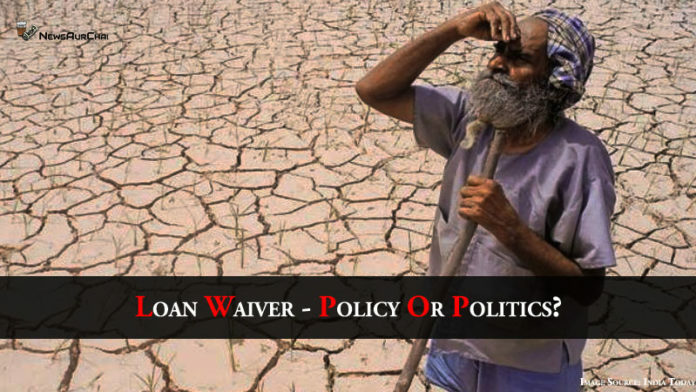 Kalam Se Loan Waiver: Policy or Politics? New Delhi: The Congress, after winning three state elections, made it a point to call December 11, 2018, a bad day for the Bhartiya Janata Party (BJP). It is, perhaps, fair to say that Rahul Gandhi scored considerable points by promising the loan waivers to farmers. Also, let’s not ignore the fact that the latest saga was started by the Prime Minister himself in 2017 Uttar Pradesh state elections. Others, noticing the electoral benefits, followed. However, we must understand that loan waivers are nothing new to India. Over the past three decades, in spite of the warnings from RBI and economists, that defaults and problems in recovery of dues would directly affect the credit system, a significant number of political parties could not resist the chance of vote maximization through debt relief schemes. It has been a political fashion to ignore budget deficits or even the fact that there’s no money to run regular schemes. It is imperative to mention that hypocrisy has been at the display from all sides in the most recent loan waiver arc. It is agreeable that with farmers’ suicide on a high rise, the situation demands urgent action. However, the debate in the public domain is always whether loan waivers should be given or not? From an economic angle, a more substantial question is whether loan waivers lead to sustainable development or not? Several pieces of research have shown that frequent loan waivers give rise to moral hazard and are likely to raise the cost of credit in the long run. Research findings have also shown that repeated waivers alter people’s expectations about the enforcement of loan contract and hence households make unproductive expenditures. To put it simply, there’s moral hazard in the behaviour of households when they expect waivers. Loan waivers caught the eye of economists and political analysts after UPA’s ADWDRS in 2008. The debate and research that followed, proved that repeated debt relieve schemes are negatively altering the behaviour of beneficiaries. Moreover, there was no significant productivity enhancement in response to the loan waiver program. The question arises, are these research findings so scarce that Rahul Gandhi and Prime Minister Narendra Modi cannot or is it that ‘Sabka Saath, Sabka Vikaas’ is limited to the political arena? With an uprising debate of sustainable development in the spectrum of middle-class taxpayers, politicians must realize that people vote for policies, not politics.